As a little heads up, in this post we talk about large breed puppies, which means puppies that will grow up to be greater than 50 lbs, like Labrador Retrievers. Is that your puppy? If so, you are in the right place. Welcome! Most generic puppy foods these days meet the nutritional requirements for small breeds and medium breeds, but large breed puppies grow differently and they have different needs. That’s why it’s important to choose a formula that is specific to large breeds. What makes large breed puppies unique is that they grow rapidly at first and then they take a long time to mature. Because of this, overfeeding can lead to serious orthopaedic issues. The most important things to focus on, specific to large breeds, are calories, calcium, and phosphorus. Skeletal problems like hip dysplasia can result from feeding your puppy too many calories or from an improper amount of calcium and phosphorus. We say “improper amount” here because too much calcium and phosphorus can be harmful, but not enough can also be detrimental to your puppy’s health. So let’s talk numbers. The number of kilocalories per kilogram should be in the range of 3500-4000. The percentage of calcium should be in the range of 0.7-1.2%. The percentage of phosphorus should be in the range 0.6-1.1%. And the ratio of calcium to phosphorus should be in the range of 1:1 to 1.5:1. We include this information for you in the products we recommend below. Calories, calcium, and phosphorus are not the only things to think about. We also need to look at the ingredients. Basically, what you want to see are whole foods that you can recognize. Avoid artificial preservatives, artificial colors, antibiotics, and fillers. 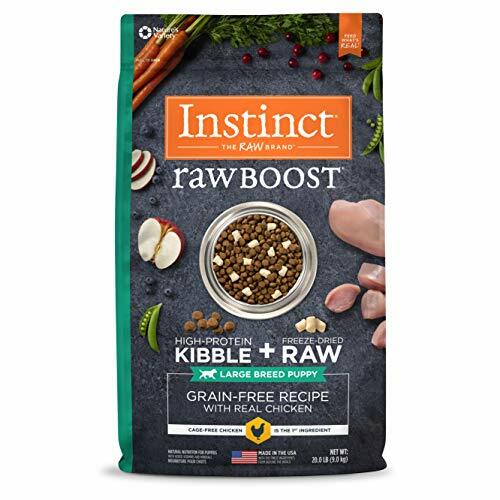 For more thorough details about what to look for and what to steer clear of when going through ingredient lists, please see our post about best overall puppy food. However, while you’re there, remember that large breed puppies need a special formula so make sure you come back to this post to look at specific products. Now, without further ado, here are our favorites when it comes to choosing the best puppy food for large breeds. (26% minimum Protein, 12% minimum Fat, 5% maximum Fiber, 1.1% minimum Calcium, 0.9% minimum Phosphorus, 1.22:1 Calcium to Phosphorus, 3520 kcals/kg) The main ingredients include deboned chicken, whitefish, chicken meal, oatmeal, peas, ground barley, ground brown rice, salmon meal, tomato pomace, and chicken fat (preserved with mixed tocopherols). 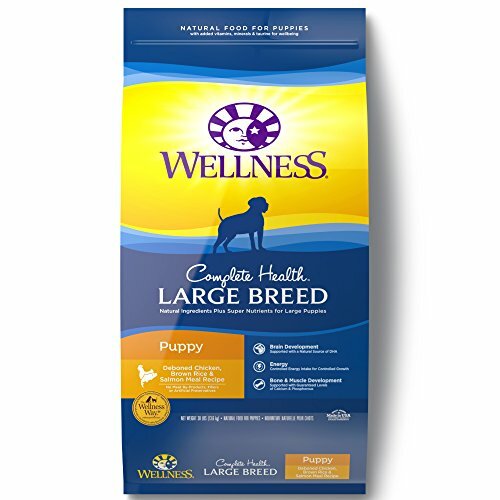 Wellness specially formulated this recipe for the unique health needs of larger breeds. Their focus is on nutrition targeting paced and steady growth. This particular recipe has 20% less fat than their normal puppy recipe for the specific needs of a larger, longer-growing puppy. The large amount of protein will help your puppy grow lean, strong muscles. And importantly, the mineral levels are closely controlled for proper bone development. Wellness is only made in the USA, so you can be sure of a quality product. You won’t find any wheat, corn soy, meat by-products, or artificial colors, preservatives, or flavors. (35% minimum Protein, 14% minimum Fat, 6% maximum Fiber, 1.2% minimum Calcium, 0.9% minimum Phosphorus, 1.33:1 Calcium to Phosphorus, 3551 kcals/kg) The main ingredients include deboned chicken, chicken meal, tapioca starch, peas, turkey meal, pea protein, tomato pomace (source of lycopene), and chicken fat (preserved with mixed tocopherols). Blue Buffalo is made in the USA. This formula is specific to large breed puppies. It is grain-free and high in protein, perfect for growing lean muscles. 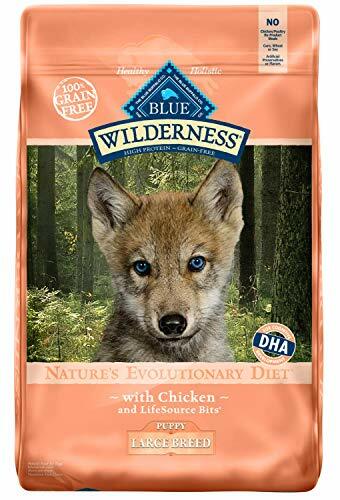 The diet of wolves was the inspiration, with plenty of DHA to support cognitive development. You want your puppy to be smart! The kibbles are even shaped specifically to help knock tartar off of your pup’s teeth for good dental health. Fruits and veggies provide antioxidants for great immune function. (38% minimum Protein, 16% minimum Fat, 6% maximum Fiber, 1.1% minimum Calcium, 0.9% minimum Phosphorus, 1.22:1 Calcium to Phosphorus, 3760 kcals/kg) The main ingredients include deboned chicken, deboned turkey, yellowtail ﬂounder, whole eggs, whole atlantic mackerel, chicken liver, turkey liver, chicken heart, turkey heart, whole atlantic herring, dehydrated chicken, dehydrated turkey, dehydrated mackerel, dehydrated chicken liver, dehydrated turkey liver, whole green peas, whole navy beans, red lentils, chicken necks, chicken kidney, pinto beans, chickpeas, green lentils, alfalfa, natural chicken ﬂavor, lentil ﬁber, and herring oil. This formula is 85% poultry, fish, and egg ingredients and 15% vegetables, fruits, and botanicals. Orijen uses fresh, never outsourced ingredients. They especially use low-ash chicken and fish in order to keep the calcium and phosphorus levels ideal for large breeds. The recipe is high in protein, limits carbohydrates, and is grain-free in an effort to mimic the diet of the wild dog. On this food, your puppy will be healthy, happy, and strong! (26% minimum Protein, 14% minimum Fat, 3.5% maximum Fiber, 1.08% minimum Calcium, 1.02% minimum Phosphorus, 1.06:1 Calcium to Phosphorus, 3809 kcals/kg) The main ingredients include duck, chicken meal, chicken, oatmeal, pearled barley, brown rice, menhaden fish meal, lamb, potatoes, dried tomato pomace, dried whole egg, and chicken fat. Your puppy will love this food! It contains fresh Wisconsin duck, low-ash lamb, hand-trimmed USDA chicken, and real Wisconsin cheddar cheese. It even sounds delicious to us! They added salmon oil, which will make your puppy’s coat luxurious, and probiotics to aid in digestion. 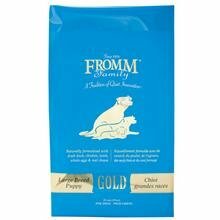 This is a special recipe for large breed puppies with appropriate calcium and phosphorus levels, as well as ingredients rich in glucosamine. Fromm hand-processes their food and they are family owned and operated. It’s a brand you can trust to provide only the best for your pup. (33% minimum Protein, 14% minimum Fat, 5% maximum Fiber, 1.2% minimum Calcium, 0.9% minimum Phosphorus, 1.33:1 Calcium to Phosphorus, 3652 kcals/kg) The main ingredients include chicken meal (source of glucosamine and chondroitin sulfate), peas, chickpeas, chicken, chicken eggs, and chicken fat (preserved with mixed tocopherols and citric acid). This one is unique. The formula includes high-protein, grain-free kibble with freeze-dried raw pieces mixed in. Your puppy will gobble it up. There is no corn, wheat, soy, or fillers. Nature’s Variety provides a nutrient rich diet and pure nutrition for digestive health. Your puppy will thank you for the natural DHA for brain and eye development, along with omegas for a soft coat and probiotics to help with digestion. They formulate this recipe to mirror your puppy’s ancestral diet. And it turned out great! (22% minimum Protein, 13% minimum Fat, 4% maximum Fiber, 1.0% minimum Calcium, 0.8% minimum Phosphorus, 1.25:1 Calcium to Phosphorus, 3910 kcals/kg) The main ingredients include duck meal (source of L-carnitine), brown rice, oats, peas, ocean fish meal, barley, white rice, rice bran, and chicken fat (preserved with mixed tocopherols). This recipe has the right levels of the nutrients your puppy needs to grow up into a large, strong, healthy dog. It is vet formulated for large breeds. One thing we like is the diversity of the carbohydrates that are all easily digested and will keep your puppy feeling fuller for longer. 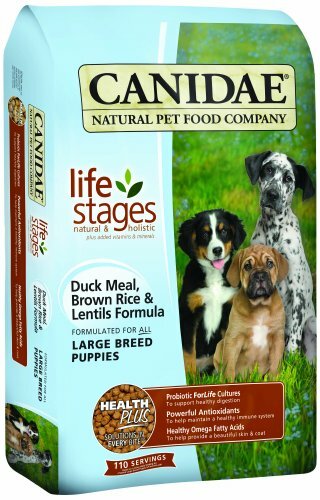 They use wholesome ingredients that come together to offer whole, balanced nutrition optimally suited to your growing large breed puppy. It’s a great choice. As we’re sure you already know, your puppy is special and unique and deserves proper nutrition to grow big, smart, and strong. Large breeds have different nutritional needs than other puppies do, so do your puppy a favor and make sure she is getting food that not only has premium ingredients, but is also specially formulated for her size. We want her to grow properly and avoid the orthopaedic issues, like hip dysplasia, that can be major risks for larger breeds. If you have further questions, feel free to contact us. We want nothing more than your puppy to grow up healthy and happy.